Over the last few decades, Iranian architects have made a significant contribution to architectural design. 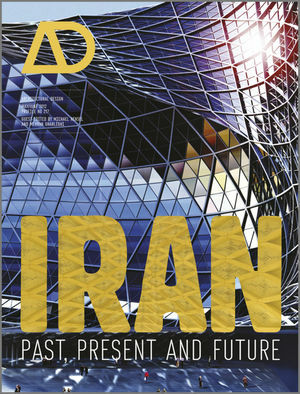 This has, however, remained largely unrecognised internationally, as architects in Iran have had little exposure in publications abroad and the diaspora of well-known Iranian designers working in the West, such as Hariri & Hariri and Nader Tehrani of NADAAA, are not necessarily associated with their cultural background. Moreover Iran, or rather Persia, has one of the richest and longest architectural heritages, which has a great deal of untapped potential for contemporary design. The intention of this issue is both to introduce key works and key architects from a range of generations – at home and abroad – and to highlight the potential of historical structures for contemporary architecture. Features Hariri & Hariri, Nader Tehrani of NADAAA, Farjadi Architects, and studio INTEGRATE. Places the spotlight on emerging practices in Iran: Arsh Design Studio, Fluid Motion Architects, Pouya Khazaeli Parsa and Kourosh Rafiey (Asar). Contributors include: Reza Daneshmir and Catherine Spiridonoff, Farrokh Derakhshani, Darab Diba, Dr Nasrine Faghih and Amin Sadeghy, Farshad Farahi, Mehran Gharleghi and Michael Hensel. Looks at garden and landscape design as well as the urban fabric in Iran from a historical and contemporary context. Includes articles on the work of post-revolutionary architecture. Michael Hensel is an architect, researcher and writer. He is Professor for 'Research by Design' at AHO (the Oslo School of Architecture and Design), where he is currently developing an architecture research centre. He co-developed the curriculum of the Emergent Technologies and Design Program and co-directed it from 2001 to 2009. Hensel has taught, lectured and held visiting professorships and fellowships in Europe, the Americas, Asia and Australia. He is the author and editor of numerous publications. Mehran Gharleghi received his Master of Architecture from the Emergent Technologies and Design Master Programme at the Architectural Association. He is an architect and researcher. He has been collaborating with prominent architects in Iran since 2004 and is the co-founder of Studio Integrate in London with Amin Sadeghy.